*Kane Williamson is fit and will lead SRH in today’s match. *He is likely to one of Jhony Bairstrow or Shakib Al Hassan in playing lineup and will open with Warner. *If Bairstrow is dropped, one of Wridhiman Saha or Shreewat Goswami will do keeping duties. *Deepak Hooda might replace Yusuf Pathan in playing lineup. *Royals are likely to name an unchanged lineup in today’s match. 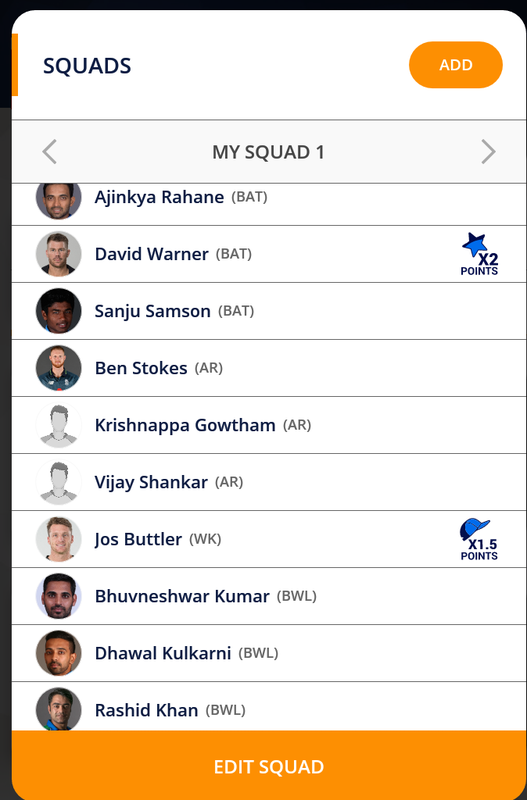 SRH: W Saha/S Goswami, Kane Williamson, David Warner, Manish Pandey, Deepak Hooda/Yusuf Pathan, Vijay Shankar, Shakib Al Hasan, Rashid Khan, Bhuvneshwar Kumar, Sandeep Sharma, Siddharth Kaul. And get ₹100 signup bonus to play. Last bowler : ‘S Kaul.